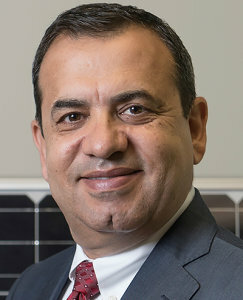 Issa Batarseh is the Director of the Energy System Integration Division at the Florida Solar Energy Center (FSEC) and professor of electrical and computer engineering at the University of Central Florida (UCF), in Orlando. Batarseh is being recognized for inventing and developing low cost, high efficiency micro-inverters for photovoltaic (PV) applications that led to the creation of the first compact single solar PV panel. The technology developed by Dr. Batarseh and his team at UCF have made significant contributions in smart solar energy conversion. As a passionate entrepreneur and innovator, Batarseh co-founded two successful solar-focused start-up companies: Petra Systems and Advanced Power Electronics Corp. (APECOR), both of which are now operating nationally and internationally. Petra Systems launched in 2007, by licensing Batarseh’s patents from UCF. Today, Petra design and manufacture the first smart-grid interactive solar power system for installation on utility distribution poles. And, the Florida-based APECOR is a leading designer of solar chargers for military applications. Batarseh is a Fellow of the National Academy of Inventors, AAAS, and IEEE, and holds 31 U.S. patents.